I'm a huge Elvis fan so I wanted to post something here for August, the month in which fans everywhere remember him and mourn his premature death on 16 August, 1977. One of the world's most collected postage stamps was issued by the US Postal Service on 8th January, 1993, on what would have been Elvis Presley's 58th birthday. Printed in a run of a staggering 500 million - three times the usual print run for a commemorative stamp - it is now officially the biggest selling commemorative postage stamp of all time. 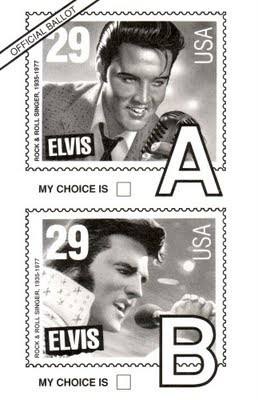 A year earlier in 1992, the USPS had held a public ballot via the postcard seen here, in which almost 1.2 million votes were cast, to decide which era Elvis should be used on the stamp. 75% of voters chose 'A' - a young Elvis depicted in a water colour by Mark Stutzman - beating choice 'B' - John Berkey's 1970s jumpsuit era older Elvis. Bill Clinton, a big Elvis fan, publicly endorsed the younger image!